Romney’s $5 trillion tax plan: Why he is afraid to explain it? Photo by EMMANUEL DUNAND/AFP/Getty Images. In today’s Wall Street Journal, Karl Rove asserts that Mitt Romney fundamentally altered the arc of the presidential race in the first debate because he came across as a “man with a plan.” And it is surely the case that, despite the president’s apparent win on points in Tuesday’s debate, the race is a near dead heat. 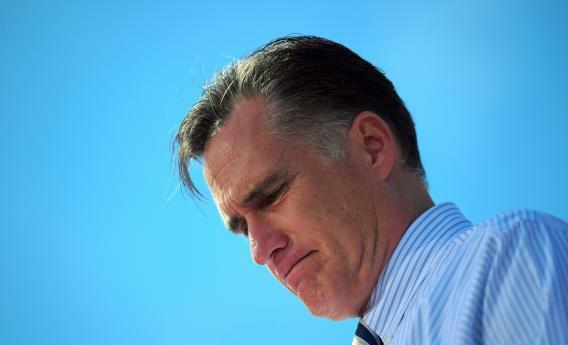 Mitt Romney must have earned a second hard look from a lot of voters who had been skeptical. The problem is that what Rove calls a “plan” doesn’t yet measure up. Romney, Paul Ryan, and their campaign need to give us answers to some of the hard questions about this plan. As the president asserted in the debate on Tuesday, what we have been told so far surely wouldn’t have been enough for Romney to justify a Bain investment in him, and it surely shouldn’t be enough to earn a vote. Let’s get specific: Rove acknowledges that the cornerstone to Romney’s appeal is the public’s belief that he will be better able to handle the economy. The centerpiece of that claim is his revenue-neutral, middle-class-protecting tax policy, a 20 percent marginal rate cut for all. This is the policy with the $5 trillion price tag over 10 years. That $5 trillion figure is a simple arithmetical extension of the current tax code and revenue figures, and is really not in dispute. So to avoid adding to the deficit, how does Romney fill that gap? So far, he’s only suggested limiting tax deductions and credits. In the debate, he suggested a $25,000 cap. But the Tax Policy Center, an independent research group, calculated that would only save about $1.3 trillion—leaving Romney a gargantuan $3.7 trillion short. In fact, even if he somehow eliminated every itemized deduction while cutting rates by 20 percent and eliminating the AMT, he would still only bring in $2 trillion dollars—less than half of what he needs. Electing a candidate with a plan is one thing. Electing a candidate who is selling a mirage is something else altogether. If Romney wants the serious second look he is getting to continue, he owes the public a serious explanation for why this plan would work. Ryan’s answer that he didn’t have enough time to explain the plan surely didn’t inspire confidence.